Monica Maschak - mmaschak@shawmedia.com Volunteer Audra Smith, of Fox River Grove, separates food donations into bags donated by Jewel Osco and Walmart at the Community Harvest Collection site in the Crystal Lake Plaza on Tuesday, November 20, 2012. Donations for the food pantry will be accepted and sorted through Thanksgiving day. 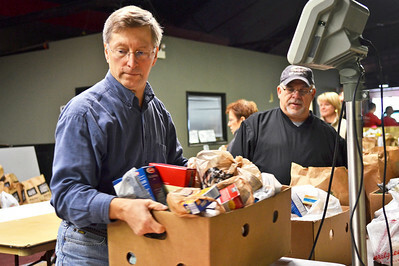 Monica Maschak - mmaschak@shawmedia.com Volunteer Jay Gorski, of Crystal Lake, weighs food donations for the food pantry at the Community Harvest Collection site in the Crystal Lake plaza on Tuesday, November 20, 2012. The Community Harvest is run by the Crystal Lake Chamber of Commerce, Crystal Lake Food Pantry and the Crystal Lake Jaycees and will be expecting donations from 700-800 community members on Thanksgiving day. Volunteer Audra Smith, of Fox River Grove, separates food donations into bags donated by Jewel Osco and Walmart at the Community Harvest Collection site in the Crystal Lake Plaza on Tuesday, November 20, 2012. Donations for the food pantry will be accepted and sorted through Thanksgiving day.